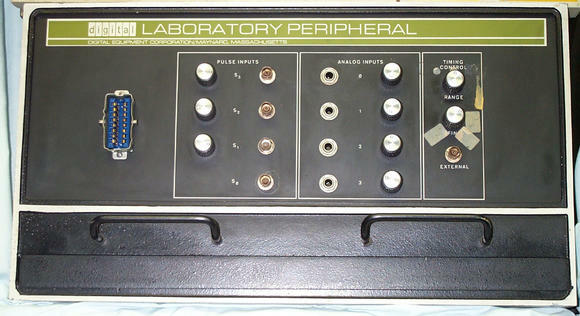 The Amphenol "blue-ribbon" connector on the left is for digital input and output signals. The pulse inputs section has three digital inputs with adjustable levels. At the bottom is a digital output. These signals are also available on the blue connector. The Analog inputs are the first four channels to the A/D converter. The gain of these inputs are adjustable with the knob next to the input. The two timing control knobs select the clock frequency for the RC clock. The range knob selects the coarse range and the fine knob selects the frequency in that range. An external clock source can also be provided.